This Thursday, the Nashville community will have a special opportunity to help Mercy Ministries while enjoying a night out on the town. 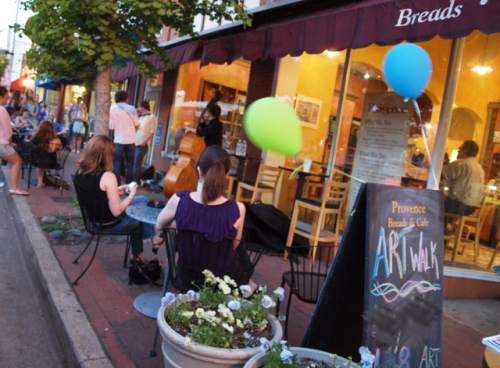 Nashville’s Hillsboro Village will kick off their monthly Art Walk on March 3rd with live music, artist demonstrations, prizes, and food and drink specials provided by local restaurants. Businesses in the Hillsboro Village area will be displaying and selling artwork created by local artists, including our Mercy Nashville residents! Artwork created by the Nashville residents will be available for viewing and purchase at A Village of Flowers, a local, family owned flower shop. These paintings are the result of artist Bert Vandermark’s ministry, Visual Parables. Bert visits the Mercy Ministries homes, talks to the residents about the purpose of God-given creativity and then encourages the girls to paint their experiences as an act of visual praise and worship. These powerful works of art tell the amazing stories of healing and transformation in the lives of the Mercy girls. Each painting is being sold for $175 to reflect the cost of one day for one girl in Mercy’s free-of-charge program. All of the proceeds from the sale of the art will go straight to Mercy Ministries. If you’re in the Nashville area, be sure to check out the Hillsboro Village Art Walk from 5:00 PM – 8:00 PM and stop by A Village of Flowers for some live music and amazing artwork. This is a great way to help Mercy Ministries while enjoying the culture, music and artwork of Nashville. We hope to see you there! If you are not in the Nashville area but are interested in learning more about Visual Parables, go to www.visualparablesart.com. Items not sold from the Hillsboro Village Art Walk will be available for purchase in April.